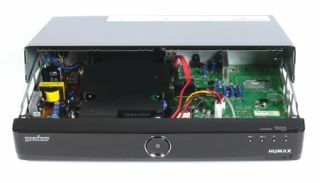 Russ Andrews tunes up Humax's YouView set-top box | What Hi-Fi? Having previously upgraded Sky, Freeview and Freesat set-top boxes, Russ Andrews Accessories has now turned its hand to the Award-winning Humax DTR-T1000 YouView box, our Best Digital TV Recorder 2012. Modifications start with improvements to the power supply: the capacitors have been upgraded, an IEC socket has been fitted so the user can upgrade the mains cable and Russ Andrews' silencer and clarity mains filters have been added. Components within the HDMI and Scart output stages have been upgraded too, and the tuner input uses higher quality parts. Finally, the boxes are supplied with Russ Andrew Big Cone Feet. The upgraded Russ Andrews YouView box is supplied wit a 1TB hard drive and costs £599.